I have spent the past few months talking to teachers and administrators about Midwest Food Connection. I am from a small town in Massachusetts and grew up surrounded by small family farms. I have always loved learning about and exploring the benefits of local food, small-scale agriculture, and access to healthy food. Before this summer I had never heard of Midwest Food Connection and, despite my interest in education, never seriously considered that my passion for food and agriculture could intersect so perfectly with elementary education. I found out about Midwest Food Connection by chance, and I was lucky enough to get an internship with them for the fall. By the time I started working I had read the whole website and talked to Uli and Haruko about what Midwest Food Connection did and stood for. But, in reality, I did not fully learn what Midwest Food Connection meant to students and teachers until I watched students in lessons and talked to teachers about MFC. 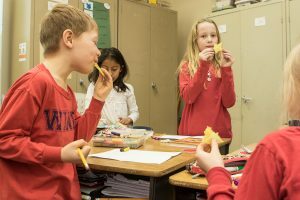 I loved going to lessons and watching Molly, Uli, or any other Midwest Food Connection teacher work with students. I saw how affecting these engaging learning experiences can be. I discovered that students as young as 5 or 6 had a lot of awareness about the food they they eat and an innate curiosity to learn more. Elementary school is not just a time where kids can learn about local foods and nature, it is a time where they must if we want to create a health- and sustainability-conscious generation. Every teacher and school administrator I talked to commended not only the content and quality of the lessons, but also the ability of the teachers to disseminate this knowledge and connect with the students. Recently, in a coffee shop, I was talking to another intern at MFC about our experiences, and a woman sitting next to us said it sounded like something her son had been talking about. I turns out that, just a few days before, her son had had one of our teachers in his class and loved it so much he had been talking about it all week. The mother said that MFC had gotten her kids to try things that they wouldn’t try at home, and she thought it was a really cool model that helped parents and teachers as much as it helped students. Teachers and administrators I talked to spoke about how MFC fulfilled a unique role, and how they made use of resources at the school and made lessons accessible for students. The mission of Midwest Food Connection is simple enough, but from what I saw and heard, the effects are powerful and dynamic.